Minneapolis is the largest city in the state of Minnesota, while St. Paul is the capital. Together they are known as the Twin Cities, although the region includes many other communities. In all, about half of the state’s almost 5.2 million inhabitants live in the Twin Cities area. The number of Twin Cities residents with at least some Latvian ancestry was estimated in the 2000 census at 2,199. Like many other Latvian communities in North America, the number of people who strongly identify with their Latvian heritage has been declining. Yet the Latvian community is still big enough to support a Lutheran congregation, a number of fraternities and sororities, the TEIKSMA folk music ensemble, an active sports group, a weekend language school, and other groups and activities. The first Latvians in Twin Cities arrived about 1908, some from the rural colony in Lincoln County, Wis., others perhaps coming directly from the East Coast in hopes of finding work in the area’s railroads and mills. The early Latvians in the Twin Cities were in the majority political radicals. Most lived close to what today is downtown Minneapolis. The first two organizations formed here were local branches of the Socialist Party (in 1908) and the Socialist Labor Party (in 1909). The latter folded by 1912, while members of the Socialist Party local by 1920 were among those Latvian immigrants who aligned themselves with the more radical Communist movement. Perhaps the best known of the early Latvian immigrants in Minnesota was Charles Dirba, who eventually moved to Chicago, California and New York and became a leading official in the Communist Party USA. Among other early arrivals was John Effert (Jānis Eferts). 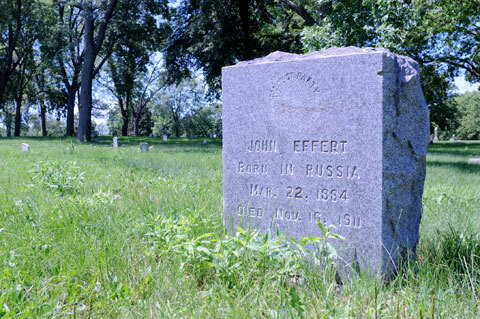 Forced to flee the Russian empire after helping to organize an uprising of soldiers, Effert moved to Minneapolis in 1909. He worked for a local railroad company and was killed in November 1911 when a pile fell on him. Effert is buried in the Minneapolis Soldiers and Pioneers Cemetery, his gravestone engraved with the Socialist Party logo. The Minneapolis Latvian Communist organization, known officially as the Minneapolis Latvian Education Society, served primarily as a social organization and continued to operate until at least 1932. Minneapolis also had a little-known Latvian aid society called the Minneapolis Lettish W.P.B. The organization was incorporated in 1917, according to government records. Better known was a later immigrant, John D. Akerman, whose research into aeronautics earned him international recognition. A building on the campus of the University of Minnesota in Minneapolis is named in his honor. Before the end of World War II, the Latvian population in the Twin Cities never exceeded more than a couple hundred. But as in many colonies, the number grew as the Displaced Persons began arriving. By the early 1950s, the Latvian Ev.-Lutheran Church of Minneapolis and St. Paul (1951) was operating, as were a Latvian school, several fraternities and sororities, choirs and a theatre troupe. Latvian DPs who had been sponsored by rural families in the region eventually found work and homes in the Twin Cities, adding to the growing population. Many were helped by DPs who secured an early firm footing, such as the late Ēriks Dundurs, who helped run a temporary residence for Latvian transplants. “Pērkonītis” (Little Thunder), a folk dance ensemble, was formed in October 1950 and performed for the first time on Nov. 18 that same year. Into the mid-1960s, according to founding member Harijs Saukants, up to 50 dancers performed with the group. The ensemble still is active today, its membership bolstered by recent arrivals from Latvia. The Minnesota branch of the Latvian Welfare Association “Daugavas Vanagi” was formed in 1952. 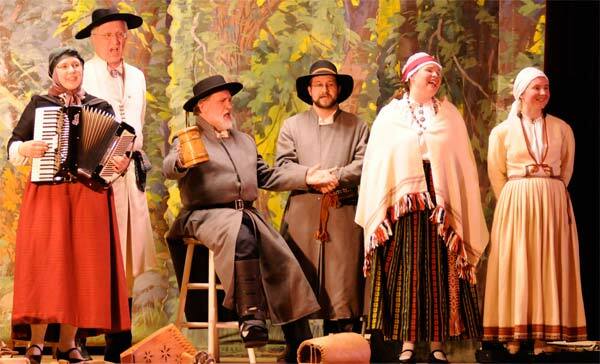 The association’s theatre troupe was founded in 1957, but the troupe no longer is active. The Twin Cities have a place in Latvian-American sports history, hosting the first national basketball and volleyball competition in 1954. The “Starts” Sports Association of Minneapolis continues to actively train and compete. The 1970s proved to be somewhat tumultuous for Latvian Lutherans in the Twin Cities. 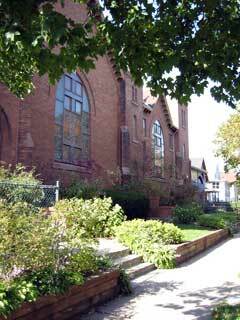 A split over various issues resulted in part of the congregation of the Latvian Ev.-Lutheran Church of Minneapolis and St. Paul leaving and, in 1972, forming the smaller Christ Latvian Ev.-Lutheran Church. But in 1978, another congregation, the Jesus Latvian Ev.-Lutheran Church, reunited with the larger congregation from which it had split in 1962. The Christ Latvian church merged back with the original congregation following the death of its longtime pastor, the Rev. Modris Gulbis. Minneapolis was home to the illustrated Latvian magazine TILTS, published by the late Uģis Skrastiņš. Many of the magazine’s and Skrastiņš’ personal records are now housed in the Immigration History Research Center at the University of Minnesota, as are a number of collections pertaining to both the pre- and post-World War II Latvian migration to the United States. Skrastiņš also was known as the publisher of many books, rivaling the efforts of New York-based Grāmatu Draugs. The late Arvīds Eglītis, meanwhile, ran a print shop that also published the women’s magazine, Latvju Sieviete. The annual academic journal Akadēmiskā Dzīve, for years based in Minneapolis, saw its publishing operations transferred to Rīga in 2001. Other Latvians of note who have called the Twin Cities home include the painter Jānis Kalmīte (known for his many variations of barn landscapes), the writer Knūts Lesiņš and the actress Laila Robiņa. The late astronomer Kārlis Kaufmanis of the University of Minnesota for many years enchanted audiences with his Chrismastime “Star of Bethlehem” presentation. As in other communities and in Latvia itself, music is an important part of cultural life. Minneapolis boasts one of the longest running folk music ensembles in North America, TEIKSMA, formed more than 30 years ago. Led by Elga Pone, the group has released three albums and has traveled throughout the United States and Canada, to Latvia and to South America to perform. Four of TEIKSMA’s members also have their own group, Lini, which has released two albums. Since Latvia regained its independence in 1991, a trickle of new immigrants, students and temporary workers such as au pairs have come to the Twin Cities. They and the older generations of Latvians in the Twin Cities continue to maintain their ethnic identity, although the scope is much narrower than in earlier years. Community efforts now are directed by the Latviešu organizāciju apvienība Minesotā (LOAM), an umbrella group formed in 2002 that coordinates events among 14 various groups. Since the Latvian House in northeast Minnepaolis was sold in 2006 for USD 600,000, community life now is centered on the church in south Minneapolis. Besides the church and its Saturday school, TEIKSMA, Pērkonītis and the Daugavas Vanagi, active organizations include the sports club, a credit union, a Catholic group, a concert association, and several fraternities and sororities. Besides the Akerman Building on the university campus, two other architectural landmarks are the former Federal Reserve Bank of Minneapolis building and Dania Hall. The former Federal Reserve building in downtown Minneapolis, noted because of its unusual “suspension bridge: design, was created by Latvian-American architect Gunnar Birkerts. The historic Dania Hall (1886) in Minneapolis’ West Bank district was the site of many Socialist meetings, dances and theater performances for the Old Latvian immigrants before World War II. Sadly, the building was destroyed in a fire in early 2000. While not architecturally significant, the Latvian Ev.-Lutheran Church of Minneapolis and St. Paul does have historical interest. The church was purchased from a Norwegian Lutheran congregation. And, in a rare link to the Old Latvians of the Upper Midwest, the bell in the church tower comes from the now-demolished Latvian church in Lincoln County, Wis. That church, dedicated in 1906, was the first church built by Latvians in North America.